From Manassas to Appomattox, for four years, this was the most bloody war in the history of the United States. In this defining war, more men died than any in other war in our history. What started as "Damyankees" and "Johnny Rebs" ended as simply "Americans!" If you are interested in the Civil War and wish to get into this exciting and full-filling hobby, then please, feel free to look around. Realize that this is an area that is continuously under construction, so be sure to check back and often. 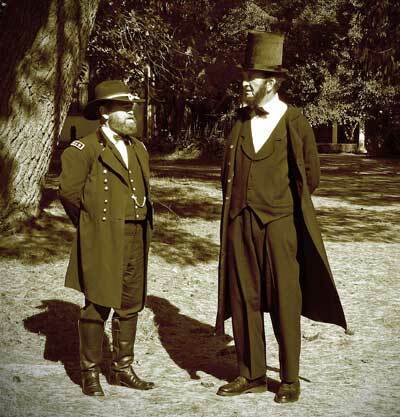 As webmaster of this T/A, I've tried to include the most up to date and informative listings for American Civil War reenactors on the internet. If you have any questions or comments, send them to Trish Furman-Leve our Time/Area Webmaster for the American Civil War. Reenacting the Civil War really began during the 1961-1965 Civil War centennial commemorations. These battles and events found a receptive audience, but public interest in reenactments faded by the late 1960's. Living history reenacting grew in the 1980's and 1990's, due to the popularity of the 125th Anniversary Battles series (1986-1990) and the 130th Anniversary Battles series (1991-1995). Recently many historic battles and events were re-created during the 140th Anniversary Battles series (2001-2005). The (2006-2010) 145th Battles Anniversary series included more realistic reenactments of major battles such as Antietam and Gettysburg. The reenactments can often take on a religious sense of a sacrament or memory. Now, things are ramping up for the 150th Anniversary series. Come be a part of it. American Civil War reenactments have drawn a fairly sizable following of enthusiastic participants, aged often between 8 on up, brave souls willing to brave the elements and spend their hard-earned money and resources in an effort to duplicate the events down to the smallest recorded detail. Participants may even attend classes put on by event sponsors, where they learn how to dress, cook, eat, and even "die" just as real Civil War soldiers would have. Most reenactments have anywhere from 100-1,000 (on up to even 10,000 for something like Gettysburg) participants, portraying either Union or Confederate - infantry, artillery, or cavalry forces. Some people, though more uncommon, can portray Engineers or Marines and some even choose to don the Veterans uniform, which is like the dress coat, but instead of dark blue with light blue trim, it is light blue with dark blue trim. To date the largest Civil War reenactment was the 135th Gettysburg (1998), which had over 41,000 reenactors and over 45,000 spectators attending. Many groups are planning on making the 150th anniversary of the battles and events the largest to date. There have also been rumours (as of yet unverified) of sponsorship by the US Federal and State governments of several of the more famous battles. Some participants are involved to such an extent as to view civil war reenacting as a lifestyle. Reasons given for participating in such activities vary. Some participants are interested in getting a historical perspective on the turbulent times that gripped the nation, particularly if they can trace their ancestry back to those who fought in the war. Others participate merely for the escapism that such events offer. Some commentators have suggested that Southerners are drawn to these activities for political reasons, because they represent a rejection of the North. Often, however, this is a false stereotype. In fact, some are Northerners that may have been "sympathetic" to the Southerners, who are often outnumbered in events in the North. In some cases, if there are not enough Union soldiers present, Confederate soldiers are asked to change sides, or become "galvanized Yankees," for the day/event. Some people are interested in reenacting other historical events, such as Revolutionary War, World War One, World War Two, and now even Vietnam battles, but Civil War reenactment is by far the most popular activity in this area. However, when reenacting the American Civil War many users have an established inference that their modus operandi must be based on historical particulars such as period correct documentation and other things. This really gives you a good feeling for the Civil War. Give it a look! We've been quite busy converting over to the new portal. And, the sutler's section is there (adding more as we go), so check it out. We also have added two new sections that we feel will greatly add to this T/A. The first is an articles section. There you can post articles on things pertaining to Civil War Living History. Secondly, there is a gallery section up, for pictures from your Living History units. We hope you enjoy the new sections. If you have any suggestions on how to improve this T/A, let us know! New!! Article about Black Civil War reenactors! New!! Article about reenacting and the 150th Civil War Anniversary!